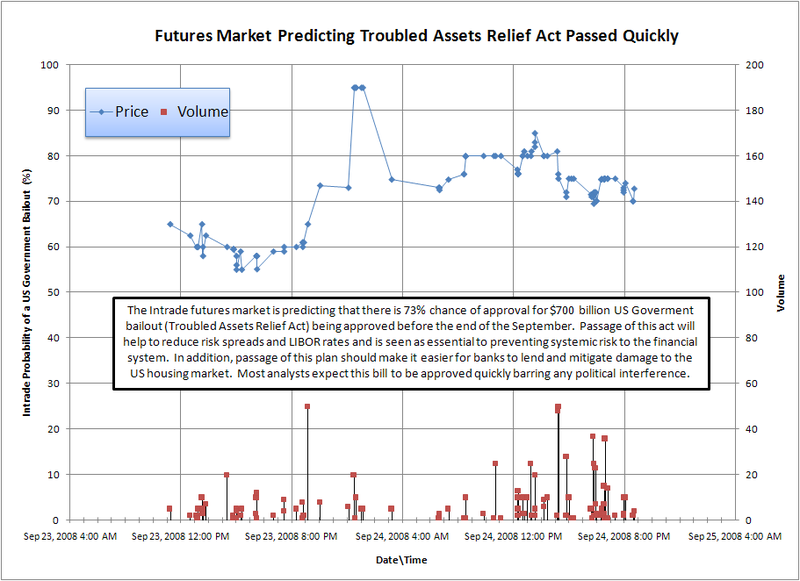 The Intrade futures market is currently predicting that there is 73% chance of approval for $700 billion US government bailout (Troubled Assets Relief Act) being approved before the end of the September. Passage of this act will help to reduce risk spreads and LIBOR rates and is seen as essential to preventing systemic risk to the American financial system. In addition, passage of this plan should make it easier for American banks to lend and mitigate damage to the US housing market. Most analysts expect this bill to be approved quickly barring any political interference. I predict a 100% chance of some form of the bill passing. Let’s be clear what this means though. It is a transfer of losses from some banks to the taxpayers. It does not erase the losses, nor does it increase wages, nor does it reduce the excess supply of existing homes, nor does it help over-leveraged consumers pay their mortgages. It just means that as defaults continue, the government will be screwed, and will have to either raise taxes, or borrow more to cover the shortfall. This recession is going to be long and deep. And from those of us who work in the financial sector can attest, the days of easy money and loose credit are long gone. 1) “It is a transfer of losses from some banks to the taxpayers.” – Mortgage paper are on firesale prices, as noone wants to hold them to maturity. If the government holds these assets to maturity then the losses will be nowhere near as big as the bailout figure. 2) “Nor does it increase wages” – The alternative would mean guaranteed job losses and guaranteed wage losses in the United States as banks would be unable to lend to small businesses and consumers. 3) “Nor does it reduce excess supply of existing homes” – Again by allowing banks to be relieved of this cost, it will allow the banks to raise capital and start lending to people with good credit so that they can buy homes and reduce the excess inventory. 4) “Nor does it help over-leveraged consumers pay their mortgages” – I actually agree with that, but aside from that the banks are writing down loan values already in the US as they would rather keep people in their house paying less than to foreclose. 5) “The recession is going to be long and deep.” – Intrade futures markets are betting there is only a 12.6% chance of a recession in the United States in 2008. So you can hold that thought until 2009. In the meantime, I and the rest of the economy are going to be focused on delivering real value to our communities through hard work. Someone has to pay! I think that is the point of the original post. If your economy is failing why reward or help those that are responsible for it? Shouldn’t you be encouraging those that actaully DO add value??? Bailing out failed companies, and failed people will only amplify the situation in my opinion. If Company A run by yahoos 1,2, and 3 is bankrupt its because they made poor decisions, the company is poorly run, it couldn’t get the job done. How does it make sense to bail them out? Shouldn’t we be encouraging Company B run by yahoo 4, 5, and 6 to expand and take over where company A faultered??? If a bank lent people money to people who couldn’t afford it and subsequently deslares bankruptcy, why should I have to pony up the cash to pay for there incompetance? Maybe its time we had a junk mortgage market??? The bottom line is that there is a exorbant amount of people “playing” the market and “playing” with the market that have no clue what they are doing. its ( i.e. only major ONLY in one subject even though, economics, tax, marketing, social behaviour, finance, and accounting are required prerequisites to make sound financial decisions) its no wonder we are in this mess. I mean come on, does it make any sense to have someone invest your life savings, and plan your investments to have knowledge of the industry limited to a weekend course??? Does it make any sense for a Finance grad to play the market when the business world requires economics, marketing, finance, accounting, sales knowledge??? Arrogance and greed is the reason the market is upside down. Why should people whom know better than to put 0 down on a mortgage pay the price for others? Why should Company A whom knows better pay for Company B whom does not??? Let the market run itself, government interference will only encourage more poor business. America is a nation that reeks of economic opportunity. Leave it alone and it will able you out. I think the goverment should take control of the mortgage industry because they are too greedy, end of story. We saw interview after interview of people standing in front of thier homes saying they could aford them regardless of the zero down of 40 year mortgage BUT when they went to renew the interest rate was 15% or 18% or higher. What financial instatution would woe thier customers into such a situation ! They do not deserve to be in bisiness and should be put in prision, thier companies taken over, at fire sale prices and the home owner offered the going rate that allows them to keep the home. The bottom line is no matter what spin everyone puts on this situation the home owner signed a bad deal with corupt lenders and this is what the goverment is for, to protect the people from harm in any form. I would expect this from my goverment and believe the same for credit card companies, 30%, 27% or anything over 8% credit cards have to be made a thing of the past. The greed is eroding everyones life and big bissiness is racking in the cash. Far interest for credit given is expected, too many people use what is offered and are not educated in the downfalls. Also a 70% chance for recession for 2009. Basically the US is in recession now but the numbers were distorted by the stimulus package (remember that cure-all) and understating inflation. I agree with Bearclaw, the US economy is in a recession and has been for the past year. The numbers don’t “support” this but its an obvious thing. Here in Tucson Arizona the recession has been felt and we have also had a dual impact due to our real estate market having gone through a serious downturn. In most places prices have fallen 30%-40% from the 2005-2006 highs. I also wrote a post on my blog about the reasons why The Bailout is needed for the current situation. As it happens, the $700B bill did not pass after all. Predictions anyone? I’m glad they moved on this quickly, although I’m sure there was some deviousness in the process somewhere along the way. the owner caan “catch-up” earlier below-described depreciation (without having filing any amended tax returns). choice of selling it to a juunk cars company. In most cases, these organizations might not exactly provide you with the best offer.